Like most people, I love a good campfire. 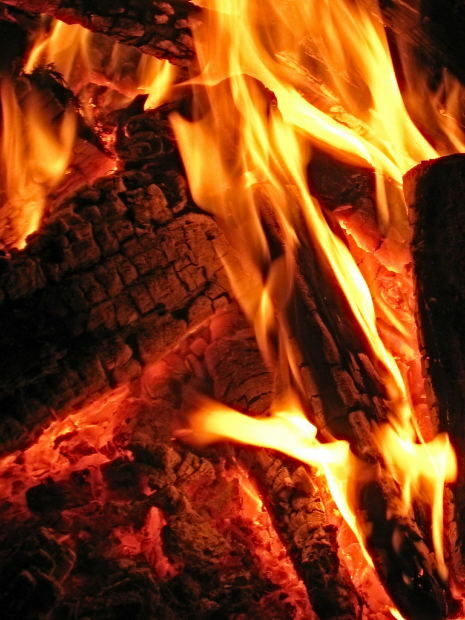 Not just for the warmth, or the delicious smell of wood smoke, or the primal spectacle. What happens around the blaze also satisfies the soul. Jokes are funnier, ghost stories are scarier, when told beside a fire. Guitars sound sweeter. Beer tastes better, no matter what brand you’re drinking. Around a fire every face is beautiful, handsome, a movie star’s face. Firelight paints us in the colors of the heart, which are the most vivid in nature and make anyone’s goodness visible. Call me crazy, but I hold up the campfire as a model, an ideal, of social interaction. Okay, I admit it—much of my enthusiasm comes from nostalgia. My wife and I have crossed the country three times in pursuit of graduate degrees and better jobs, and now we’re raising young twins. As a result, I often feel cut off from my people, the characters of my formative years, the faces I know and love best. To recreate the campfire’s fortifying light of friendship, I depend on the Internet. This is an odd substitution, since my computer emits a rectangular glow the color of oven gas, and the only face hovering in it is mine. Readers hoping for a diatribe on alienation in the digital age will be disappointed. In the balance, I can’t ignore the benefits of Facebook, LinkedIn, and my grad school’s alumni site, all of which have enabled me to hear from folks I knew ten, twenty, thirty years ago. These contrivances do, in fact, serve precise networking and communication needs. But when we talk about the environments they create, can we really use the term “connections?” Are we actually “linked” through them, as if we’re all rubbing elbows at a beach bonfire? I think “sighting” is a better term, and I’d wager that other users, especially busy parents, agree. An online network is a saccharine wilderness though which we hike without compasses, following the traces, the signal fires, of our old companions. They’re out there somewhere, leaving clues as to their whereabouts and activities, but we can’t actually locate each other’s campsites. If we could, what would we find? Footprints? Empty bottles? Charred earth? Instead, we content ourselves with offhand searches, good-faith struggles to catch up. I don’t have any grounds to complain about this. If friendship means random sightings and fragmented sentiments spread daily across the screen of my laptop—well, that’s better than complete darkness. Besides, the brightest lights in my life are my wife and kids. Ah, yes, my kids. Will their old man’s Web-centered social life keep them from learning the value of face-to-face camaraderie? Maybe one day I’ll own a back yard big enough for a fire pit—where my children, once they’ve logged off for the night from Moonblast or Cometspeak or whatever they’re using, can forge real friendships around a crackling inferno. Guitars will be optional.